I recently posted about installing Windows 8 on VirtualBox which at the time was at version 4.1.8 and the Guest Additions did not install. 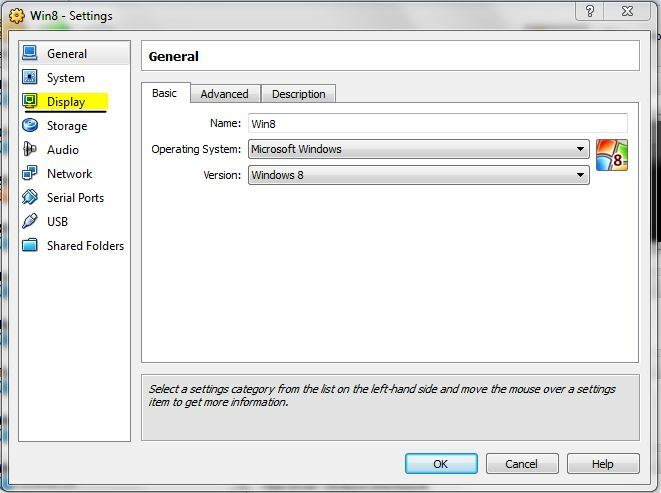 VirtualBox has now been updated to support Windows 8 with the Guest Additions which solves the problem of the weird resolution problem that you get when installing a guest OS without the proper VirtualBox drivers. Unfortunately some people (including myself) have been having a problem that when installing the Guest additions the screen goes black and then doesn’t come back even after a restart. The symptoms are that and the ability to still alt-tab and see things before you restart for the first time. The problem seems to be related to the graphics driver and the handling of 3D acceleration. I have managed to work out a solution that works for me, but this is not to say it will work for everyone. It needs to be done before installing the Guest Additions and getting the black screen the first time, if you already have the black screen issue you will need to either restore from a snapshot before you did this or a reinstall the OS. Update: rseiler posted on the VirtualBox forum stating that another option if you are already getting the black screen issue before trying this fix, then you can uninstall the Guest additions by going into safe mode. This can be done apparently by disabling the network in the VirtualBox settings, which then gives repair options when you boot the Guest OS, one of which is safe mode. Thanks for this tip as I was unsure of how to get into safe mode in a Windows 8 Virtual Machine without pre-enabling it. This solution does not seem to work for all, but I have heard from a lot of people that it has worked for them. Before installing the Guest Additions untick the 3D acceleration tick box in the display properties from the VirtualBox menu. Then boot up the Windows 8 Virtual Machine and install the Guest additions. During the install you will get the black screen as before, that’s normal, just wait a few minutes then turn off the virtual machine from the VirtualBox menu. 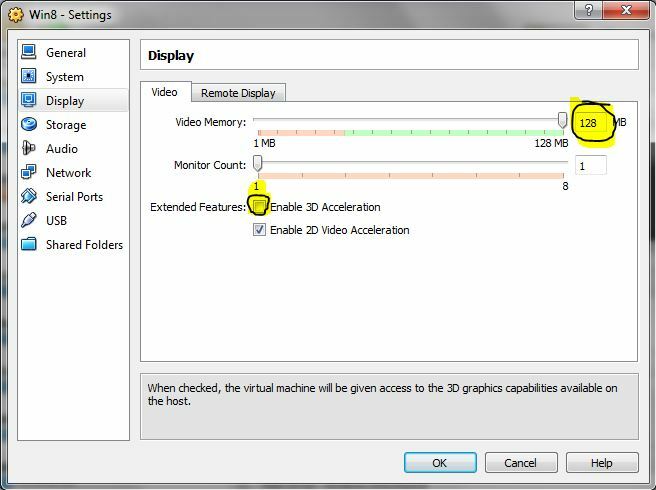 Then go into the Virtual machines settings as before and tick the 3D Acceleration check box and hit OK. Boot up the virtual machine and it should all be working with the Guest additions installed. People are still getting some problems with the Guest additions such as some screen flickering of the Guest OS as well as some Metro app problems, but there is not a fix for this as far as I know. We probably will just need to wait for an update to surface for VirtualBox. Once this is done you can you can enjoy the Full Screen version of Windows 8 and get a better feel for the new OS. I hope this information helps anyone who was stuck on this issue, thanks for reading. Following your steps, I’ve managed to get the Guest Additions installed, but display still doesn’t work with 3D acceleration ticked, though it does with 2D. Also, haven’t got any more resolution options which I was hoping for. The new versions of Virtual Box with updated Guest additions have fixed the black screen issue, if you haven’t upgraded to the latest release that would be the first thing I would try. If your still having problems it would most likely be an issue different to the one I was having and I wouldnt know what to try. then uninstall Guest Privileges. But before rebooting, go back into msconfig and turn off Safe mode. As for whether this solves the black screen… i’m already running the latest Virtual Box. My specific black screen has been in Excel 2013 – the ribbon keeps going black, then eventually all of Excel. Try going back to the Desktop, but the image on the screen doesn’t change (mismash of black and Excel). All this started happening after installing Guest Privileges.. so trying again. I installed Windows 8 Enterprise (32-Bit, final) in Virtualbox 4.1.20 with Windows XP as the host. VBox “knew” Windows 8 and switched 3D-acceleration ON by default. I left it that way, but gave it 1280 MB of RAM and 256 MB of video-RAM. All installed fine, but when I installed the guest additions, Windows 8 “went black and never came back”. I booted from the image of the Windows 8 install-DVD and chose “refresh my PC” from the repair-options. This removes everything you installed, but leaves your data intact. It took a while but it worked and there is no sign of guest additions now. But I can still move the cursor freely without having to press the “Host-Key” to leave the guest’s window. And… I am getting sudden screen-blackness, which goes away when I move mouse-cursor. Update: Weird behavior like responding to a click only after mouse-cursor is moved, switching back to En/US-keyboard layout or sudden blacking persisted – even during attempted “Resetting my PC” (practically a reinstall with removal of all accounts). It looks like this failed installation of guest additions screwed up something in virtualbox. I’ll just erase this virtual machine and start from scratch. This time WITHOUT guest-additions. Nice post. I just unchecked both 3D and 2D options. It is now working fine for me for Windows 8 as well as Windows Server 2012 :). No guest additions means: no shared folders. But with the Vbox extension pack installed, USB-sticks work flawlessly and files can be exchanged between guest and host this way. It also means that the guest’s screen is not scaled. I found it best to work in full-screen mode. I find you can use the task manager to remove the vbox video driver in the black screen and restart to get everything back. Restart and enough your vbox. Thaks a lot!!! From Uruguay. Enabling *just* 2D Video Acceleration fixed a problem I was getting. I had 3D and 2D Video Acceleration disabled, and I was having terrible trouble with a Windows 8 guest under VirtualBox 4.2.6. Kept getting flashes of a black screen of the guest, eventually it would kill the Windows 8 login session and go straight to the Windows 8 login screen (have to login again on Win8, but all apps had been terminated). Host was Ubuntu 8.04 LTS (old Ubuntu but always has been reliable for me!) with Q6600 and and old AMD video card. Guest was Windows 8 Pro with VirtualBox 4.2.6 guest additions installed. Virtualbox 4.3.10, Windows 8.1 express install with network cable unplugged during initial install. With the network cable plugged in, I found that when I inserted the Additions ISO, the screen went black. No amount of activity, ctrl-alt-del, tab or anything would bring it back, although, I could see the VM was doing network and disk activity. My solution was to simply unplug the network cable, give windows 30 seconds or so then RESET the VM. Boot up, then run Windows Explorer and run the VBoxWindowsAdditions.exe as administrator. Install went fine, rebooted and all was good. Re-connect the Network cable and continue as normal. I had video memory at 42MB, no 3D, before or after. I do have 2D acceleration enabled. Thank you for the info. I have several VMs on Virtualbox and they were great until one of the Virtualbox updates back in 2013. After the update, Remote sessions into the VMs had a bad video side effect (the VM goes dark on the host after a remote session). I just brought up a W 8.1 VM and it had an annoying black rectangle in the remote view and also went black on the host. Reviewed my setting against your recommendations as sure enough, unchecking 3D fixed them all! my problem is when i create a machine and run it, it goes to a DOS-like black screen. if you type help it gives you the commands and so-on. After i found this threat, I thought it could be something with the new display driver what the Guest Addition installs. With some tricking (clicking on the red X to close VM windows brings back a somehow interlaces lookalike screen, so you can see where you are in the interface of the Virtual Win) I rolled back the display driver, and voila, it works again.